Veins are the blood vessels that take the deoxygenated blood back to our heart. For the blood in our legs, it is found in superficial veins situated just below the surface of our skin and then taken to deeper blood vessels found in the calf muscles. It is then the muscles within our calves that push the blood up towards the heart, against the force of gravity. The veins are classified as ‘one-way’ meaning that blood cannot flow back down them towards the ground due to the closing off of valves. However, sometimes these valves can fail to close causing blood to pool in the superficial veins. After a while, these veins begin to swell and this causes them to become varicose. There are also smaller spider veins that can also occur and are very similar to varicose veins. The difference being that they appear much closer to the surface of the skin and do not appear as swollen. Both of these problems have available vein treatment options with the majority of treatments being relatively straightforward and pain free. Surgery can sometimes be taken on however this is rare and only for large varicose veins. In most instances, sclerotherapy is sufficient. Sclerotherapy is the injection of ‘irritant chemicals’ that causes the walls of the affected blood vessel to collapse and then as they heal together, the walls are sealed which results in the affected area no longer being able to transport blood. The procedure is relatively simple but can take some time and the overall healing process can take anywhere between two and six months depending on the person. A compression sock is also required to be worn over the affected area for this time. Laser ablation is a modern form of treating the condition that uses a highly accurate laser to heat up the problem blood vessels and cause them to collapse. Collapsed blood vessels are then re-absorbed into the body by natural processes. More serious conditions may require a more invasive laser that heats up the blood vessels from the inside out. This type of surgery is only necessary in the worst cases and is likely to have more downtime required afterwards. Post-operative care is important after these kinds of surgery as minor bleeding and scarring can occur. It’s important that bandages and scabs are allowed to fall off the body naturally. Compression stocking should be worn for about 3 days following the surgery and taken off only to wash or sleep. The stocking will help to promote blood flow in the legs and ease some of the swelling post-surgery. 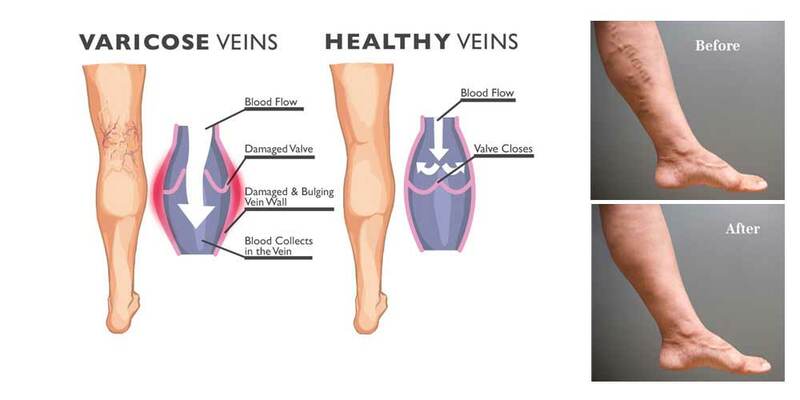 The vein treatment for these issues is not only for the physical appearance but can be for health related issues. Varicose veins can cause health problems and in fact be dangerous with potential blood clots and ulcers. Women should also limit their use of high heels as it affects the ability of larger veins to function. This involves taking them off when sitting at a desk and once home. For anyone experiencing any of these symptoms is is recommended that they see a doctor to determine whether or not they may need vein treatment. Because of the potential seriousness of the issue, the sooner it is treated the better and this also likely leads to a simpler method of treatment that avoids surgery. Getting quality varicose veins treatment is the best way to get rid of bulging blood vessels and their symptoms. Whether the issue is cosmetic or has more severe symptoms proper surgery from a specialist is the only proven method of treating the condition. Swollen and or painful blood vessels in the legs are never a good thing and can be quite unsightly. This is especially true as time goes on and the issue is left untreated. The look of swollen blood vessels can affect a sufferer’s self-esteem and prevent them from pursuing the same lifestyle they once did. Many sufferers won’t wear shorts or bathing suits for fear of revealing their condition to others. This can have a compounding effect on someone’s health as they may potentially become less active in their daily lives. Even if it’s just a cosmetic issue, the side effects can be quite devastating. If the condition is causing regular pain and discomfort then medial help should be prioritised. If left untreated the blood vessels will only become more swollen and become prone to bleeding or the development of ulcers. 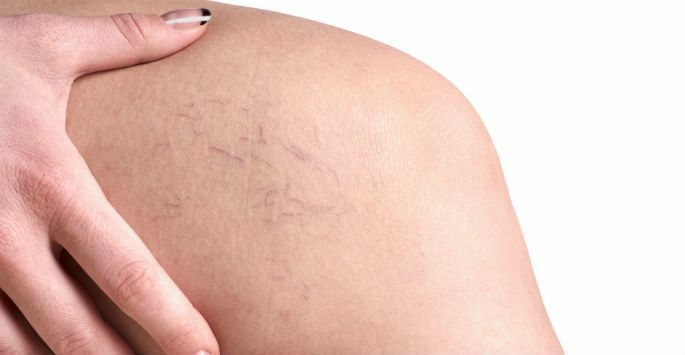 While the issue comes in a wide spectrum of severity, there are always good reasons to seek professional vein treatment.